Leave your Instagram posting worries to Smartpost. Plan, manage, schedule & post all your content the smartest way there is. Connect multiple accounts and improve engagement through Instagram stories, pre-defined captions, first comment, location tagging and more. Upload your images, videos, albums or stories for your Instagram account on mobile or desktop. Post right away or schedule for later. Leave the boring repetitive stuff to us, use the time you save to get creative or strategic. Multiple accounts - Easily switch between different accounts in the same interface. 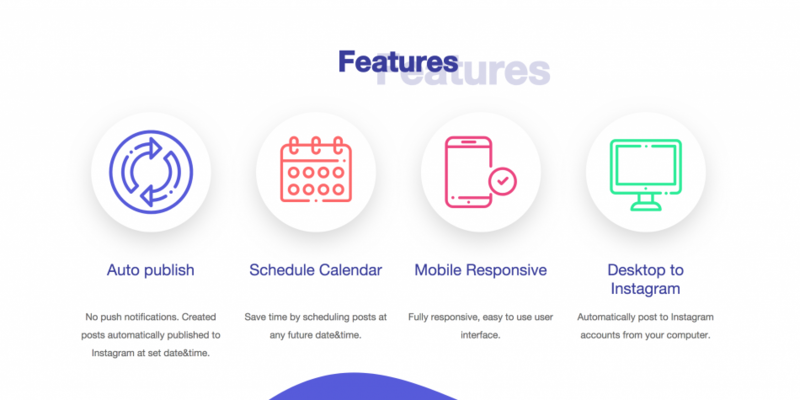 Auto publish - Schedule a week, month or year of posts and forget about it; we'll automatically post them at your set time. Post types - Photo, album, video. Desktop to Instagram - Automatically post to Instagram accounts from your computer. Cloud import - Sync photos and videos from Google Drive, Dropbox or OneDrive. Content library - Keep all your photo and video content in one place accessible from any device. Location tagging - Increase visibility and engagement by location tagging. Pre-defined captions - Save additional time by pre-defining your captions and hashtags. Type it just once. They are a click away. First comment - Claim the first comment, and schedule it at the same time as your post.